Sometime your windows 7 may show unknown icon for many programs in start menu. There is no proper cause of this problem, and the problem can occur on any windows 7 system. If you are facing similar problem, here is how you can solve the programs unknown icon problem. Delete IconCache.db file located in this folder. The file can be hidden also. If there is no IconCache.db file, proceed to next step. Right click the newly created IconCache.db file and make it Read Only. Windows 7 start menu should now show proper icons for all programs. 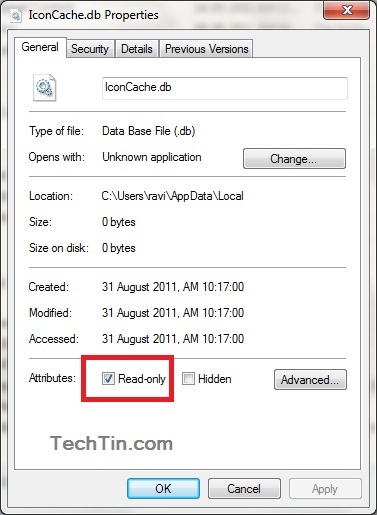 Uncheck the Read Only box of the IconCache.db file.